It's not hard to convince Ryan or I to drop all original dinner plans for a burger instead. It was raining when I left work on Friday, which threw what little motivation I had left to make dinner out the window. When Ryan asked what I was making for dinner I quickly suggested heading over to The Burger Co. to try out their food. Located only a couple of miles away from our apartment, The Burger Co. is a casual burger joint with lots of delicious options. Ryan chose one of their stuffed burgers, the Freemore burger - cheddar cheese stuffed burger topped with BBQ sauce, an onion ring, bacon and tomatoes. It looked super messy to eat but he really liked it. I went with a more classic choice, the Bacon cheeseburger - burger topped with pepper jack cheese, bacon, lettuce, pickles, and onions. On the side Ryan and I shared an order of tater tots. 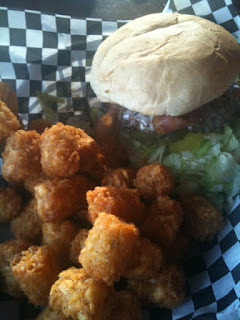 The burgers were tasty ... the tots tasted like they were fried in old oil. 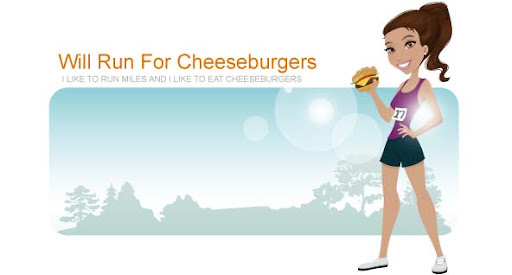 I would definitely go back to The Burger Co. to try one of their stuffed burgers. Definitely good fuel after running some miles earlier in the day.